The shockingly lenient verdict handed down by a West Papua court to a police officer charged with illegal logging, fuel smuggling and money laundering is an appalling indictment of Indonesia’s utter failure to tackle corruption within the forestry sector and the strongest evidence of a cover-up that the Environmental Investigation Agency (EIA) has witnessed for a long time. Labora Sitorus, a low-ranking police officer based in Sorong, West Papua, was earlier this week found guilty of just one of the charges – illegal logging – and was sentenced to two years in prison and fined a mere US$4,000. He was acquitted of money laundering, despite evidence showing US$127 million passed through his accounts, some of which was connected to shipments of timber that the judge has now ruled to have been illegally taken. In January 2013, enforcement officials seized 2,264 cubic metres of merbau in 115 containers that had been shipped from Sorong to Surabaya in East Java, Indonesia’s largest timber trading port. The total value of this illegal timber is estimated at US$20,370,600 (current market prices for merbau are estimated at US$900 per cubic metre). Further investigations led the Financial Transaction Monitoring Centre (PPATK) to reveal that Sitorus had paid up to US$1million to local, regional and national police officials between January and March 2013. In September 2013, when prosecutors were given the dossier from the police that allowed Sitorus to be charged, the issue of corruption was conspicuous by its absence. By neglecting to charge Sitorus with corruption, 33 police officers who allegedly received money from Sitorus were ignored. This is not the first time that a case involving police in Papua has failed to convict influential defendants. 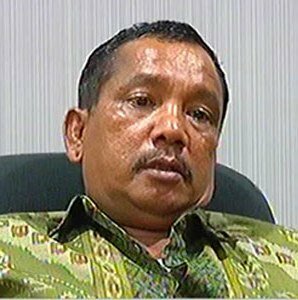 Police Commissioner Marthen Renouw worked as a police officer in Papua for 29 years, amassing a position of power stretching from the capital of Jayapura to Sorong, where Labora Sitorus is also based. Renouw was arrested in April 2005 during the unprecedented enforcement operation codenamed OHL 11 and was transferred to Jakarta for questioning. Again, PPATK detected a series of suspicious transactions involving five bank accounts. As in the case of Sitorus, evidence was passed onto police to follow up but only one bank account was scrutinised. With further evidence proving that Renouw had received money from an illegal logging syndicate while he was supposedly leading operations against timber theft in the area, the Attorney General’s office charged Renouw under anti-corruption and anti-money laundering laws. Renouw was brought to trial in November 2006 in his power base of Jayapura. He was acquitted of all charges. EIA and partner Forest Watch Indonesia (FWI) unreservedly condemn this latest blatant manipulation of the law by the police, along with the risible verdict from the panel of judges who have completely failed to bring to justice all those responsible who profited from this forest crime. EIA/FWI is also concerned that the SVLK, Indonesia’s new mandatory traceability scheme intended to ensure the legality of all materials in Indonesia’s domestic and export timber markets, was insufficiently robust to stop this illegal act from occurring in the first place. The company responsible for the illegal logging and transport of the 115 containers of merbau – PT Rotua – was ultimately able to sell its illegal timber to exporting companies certified as legally compliant under the SVLK. None have been investigated or prosecuted. With Sitorus now guilty of illegal logging, EIA/FWI believe all his clients should have their SVLK certificates revoked or, at the very least, be re-audited. It is highly likely that all the illegal merbau sold on to traders by PT Rotua has been or will be exported abroad. This is in direct violation of Indonesian law. Apart from the SVLK independent monitors, the wider SVLK system and stakeholders have played no role at all in preventing this multi-million dollar forest crime. Not one company that dealt in and exported Sitorus’s illegal timber is being investigated and prosecuted, including Sitorus’ own timber company, which has been allowed to continue operating with apparent impunity. The deeply compromised case against Labora Sitorus and the subsequent failure of the judiciary is a major warning that, despite all of the commitments and agreements the Government has made to combat illegal logging and the associated illegal trade, Indonesia has still to prove its commitment to enforce the law against forest crime. EIA has been aware of Sitorus and his illegal activities since 2009, when investigators documented loggers illegally harvesting merbau trees without Government approval. You can view and embed the footage here.